City & Guilds and the IET recently held a webinar for training centres about the 18th Edition. With the 18th Edition set to launch on the 2nd July, the awarding body and the institution are joining forces to ensure that electrical professionals are trained to a high standard and compliant with the new regulations. The Wiring Regulations aims to reflect the way in which we use electricity here in the UK and help maintain the minimum standard in effort to keep installers and electrical systems safe to use. As technology changes and develops, so too does the Wiring Regulations. 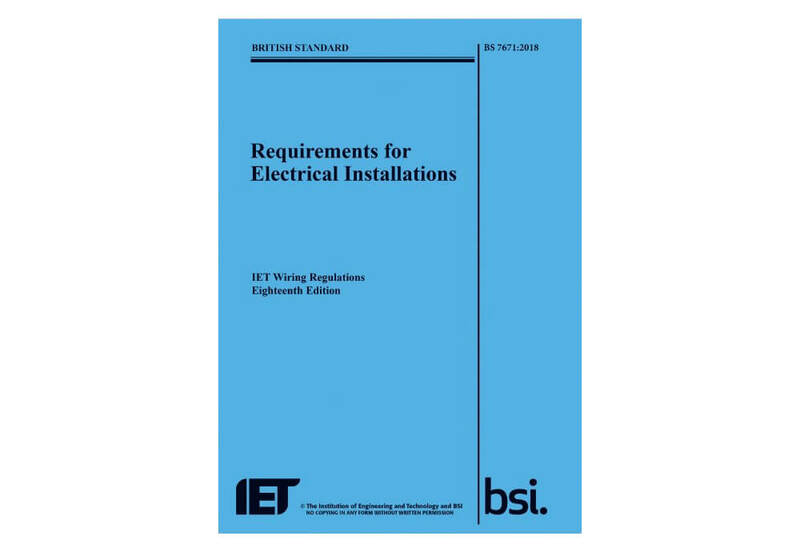 The 18th Edition of the Wiring Regulations publication and City & Guilds 2382-18 exam will released on the 2nd July and the publication available to pre-order now. In July/August, all associated IET guidance notes (1-8) will be published, along with the new IET Electricians Guide to the Building Regulations and the Code of Practice for the Installation of Electric Charging Equipment. Between July 2018 and the 31st December 2018, both the 17th Edition Amendment 3 and the 18th Edition will be classed as current publications. Although they are both current publications, any new installations must conform to either the 17th Edition Amendment 3 or the new 18th Edition, you cannot mix editions. All electrical professionals are expected to be up to date and aware of the new changes to the BS 7671 Wiring Regulations by 1st January 2019, when it comes into force. The 17th Edition Amendment 3 will no longer be a current publication or qualification. Here is a brief overview of some of the key changes and updates. The 18th Edition will see new definitions included, such as departure (which has been redefined), non-compliance, partial selectivity and total selectivity (both replacing the word diversity). The word ‘ensure’ has been removed completely from the 18th Edition, this is because it has been noted that it is very difficult for installers to ensure anything. In Chapter 41, there have been some changes to the ratings of socket outlets requiring additional protection and changes to the ratings of circuits covered by table 41.1: disconnection times. Luminaires (lights) in domestic installations will require additional protection, and also, where bonding can be omitted. In Chapter 42, you will see the introduction of Arc Fault Detection Devices (AFDD). Whilst commonly installed in other parts of the world as standard, within BS 7671, they are only a recommendation. In Chapter 44, there are many changes within section 443, including transient overvoltages due to lightning strikes and surges. Section 444 sees changes to separation guidance and a new table introduced in effort to reduce the effects of electro-magnetic interference (EMI). In Chapter 51, you will see that the RCD testing period has been changed from a recommended quarterly test to a six monthly test, with the hope that it will make it easier for homeowners to remember to test them. In Chapter 52, there have been improvements made to stop the premature collapse of wiring systems. In the 17th Edition it looked at just escape routes, however, this has now been upgraded to include more than just escape routes and now covers all electrical systems. In Chapter 53, a table has been included to show the maximum value RA information for RCD ratings, which has now been extended to 20A (20,000mA). There are also changes relating to Surge Protective Devices (SPDs), which relate to Chapter 44. In Chapter 54, foundation earthing is now recognised, which is hoped to increase the awareness of it. You should expect to see more extensive requirements for foundation earthing included in the 18th Edition Amendment 1. Chapter 55 sees very minimal change, however section 559.10 now includes requirements for ground recessed luminaries in decking. Within Part 6, you will notice that testing continuity of ring final circuits now falls under continuity and if there is a risk of damage, when you’re doing insulation resistance, then testing line to earth only is permitted during an initial verification. A polarity test of the supply is now a requirement during the testing procedure before an installation is energised. In Appendix 6, there have been subtle changes made to the schedule of test results, which cover: test voltages to be declared, AFDD’s have been added to circuit details, Max Zs has now been added on and RCD data is also included in circuit details. In Appendix 14, it contains new methods for determining prospective fault current. Appendix 17 is brand new and covers energy efficiency. Due to the huge demand on the distribution network and concerns over environmental impacts, it has been included as an appendix. There is an extremely high interest in energy efficient electrical installations, which means that the potential for more involvement and updates to this section is possible in future amendments. If I start a job in December 2018 and finish a job in January 2019, is it okay to sign it off as 17th Edition Amendment 3? Yes, you can. If you design and install any work prior to January 2019, you must either comply with the 17th Edition Amendment 3 or the 18th Edition. If your work complies with the 17th Edition Amendment 3, you must declare this on the Electrical Installation Certificate. What change or new regulation is expected to cause the most difficulty? In regards to installation difficulties, we expect the supporting of wiring systems in all part of an installation against premature collapse to cause the most difficulty. This is because current cable insulation methods are likely not to be deemed sufficient. Despite the 18th Edition only just due for release next month, work has already begun on Amendment 1. Only two amendments will be allowed before the 19th Edition is released and it is expected that there will be a 3-5 year gap per amendment, to allow for the industry to adjust to changes. The 19th Edition is not expected to be released for at least another 9-15 years. The industry is constantly trying to keep up with technology and the increase in solar, wind and battery storage, as well as electric vehicles and smart homes. You can expect future amendments to develop further alongside these new technologies. 18th Edition courses will be available from July onwards. Book your 18th Edition course now!